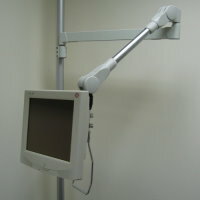 Ultra-Long adjustable arm(model #60222-GH series) - Sallas Industrial Co., Ltd. This two arm system is designed for circumstances need ultra-long arm reach. The design incorporates arm lock for locking monitor in desired position and for loading heavy weight monitor. The "lift & lock" allows easy one-handed operation by lifting handle for opening lock and release handle for locking the adjustable arm. Ruggedly constructed steel arm parts with quality surface coating and provision for internal housing of monitor cabling. 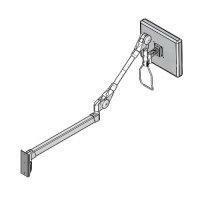 Two arms side to side rotation and 180° display side to side rotation. Loading weight for max. 11kgs (25 lbs). Durable steel heavy duty wall mount bracket and pole mount clamp are available.